I visited Boston for the first time recently (for a work trip), and through the awesomely helpful service of Blacklane, got to the airport without a hitch and in style. Though I received my ride with them complimentary in exchange for this mention, I have used them in the past before and overall, it's a nifty car service that is easy to use, provides great customer service, and alerts you every step of the way so you are on-time and relaxed. 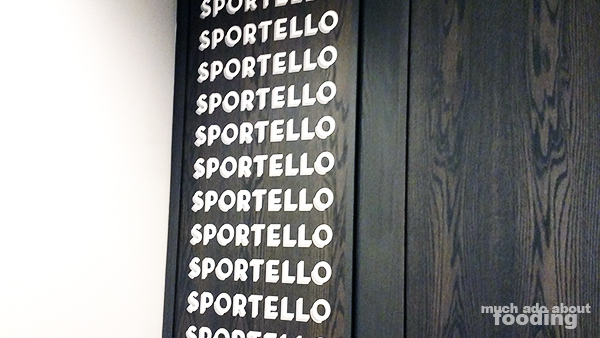 That being said, once I landed in Boston, it was time to hit up the food scene and Sportello was on my list. Boy was I glad it was because it was just about the best meal I had the whole trip! Please note that if you are going for dinner service, reservations are recommended here. If you arrive in the area prior to your reservation time, I highly suggest going downstairs to Drink where you can get stellar cocktails in a basement bar. All you have to tell your bartender what you're feeling like at that moment (sweet, sour, bitter, etc) and he/she'll shake you up something nice. Once you go back upstairs to Sportello, you'll find yourself in a room with U-shaped long tables that are primed for service in between and to see the open kitchen. There are also ancillary tables around the room to fill it up properly and give those wishing to sit non-bar-stool-style a back to rest upon. We snagged a table and were greeted right away. The menu is simple enough with just a few items but all were noteworthy. 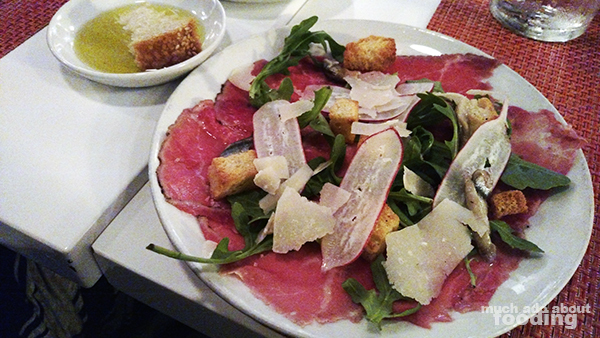 To begin, we just had to dig into the Beef Carpaccio ($14 - with boquerones, Parmesan, and radish). How do I say no to the silky thin slices of raw beef? Shaved Parmesan, shaved radish, crouton, and arugula gave a lot of crunchy contrast to the soft slices but teamed up with boquerones, made it feel much more like a salad than an appetizer. I ended up rolling the beef around the ingredients to create mouthfuls that would incorporate all tastes. Thumbs up on this one. What drew me to Sportello in the first place and made me place the reservation was the promise of fresh, housemade pasta. I'm a sucker for that because there is just something so luscious about the way it feels in your mouth as compared to re-hydrated pasta. The restaurant did not disappoint. 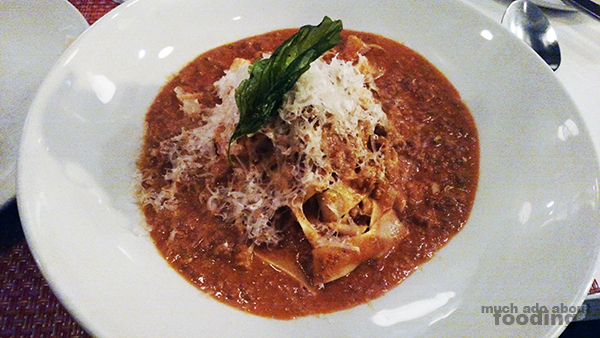 I went for their Tagliatelle ($24 - Bolognese sauce and fried basil) by recommendation of our waitress, and my tablemates went for a rabbit ragu pasta and the above-pictured, delectable Polenta with thinly sliced mushrooms, fresh shaven black truffles, and shaved Parmesan. My pasta - wow. The bolognese is definitely a point of pride for them and with good reason because it was very hearty, rich in flavor, and bold in comfort. I loved also the addition of fried basil atop the food for a different spin on the herb incorporation, and yes, oh yes, the pasta was what I had been hoping for. My friend's polenta was likely the best way I've ever tasted it prepared, practically melting in your mouth. 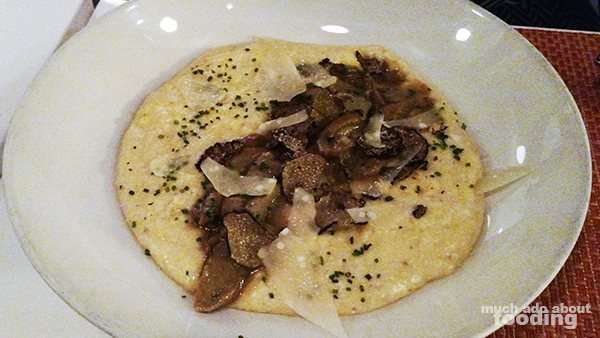 Truffle could only help, and all the flavors married together quite well in that dish. Overall, we had an excellent experience at Sportello, especially with our waitress who was knowledgeable about the wine list (an impressive selection) and very attentive. The food and ambiance was just what I was looking for that evening.